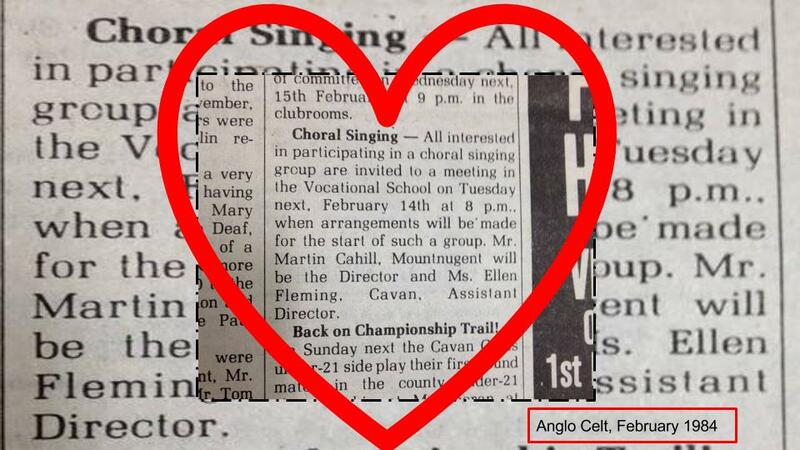 Today is our 32nd Anniversary, Birthday, Valentine, whatever...and here's the Anglo Celt notice of the first rehearsal on 14/02/84! Special mention to Dollé Cullivan, Sally MacKenna, Phyllis McMonagle and Martina Lee Boyle who were there on Day One, and are still singing with us now. Cavan Singers, a community SATB choir, hold rehearsals in the Hotel Kilmore weekly. We are members of Cumann Náisiúnta na gCór, the Association of Irish Choirs. Eileen Tackney - a native of County Cavan - is a published composer, arranger, performer, conductor and teacher. Eileen has worked with Cavan Singers for many years as accompanist, soloist and arranger. 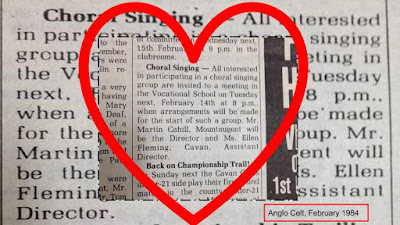 She is also Musical Director of Cavan Cathedral Choir. Eileen also directs and performs with local group Song Sisters.